I love teaching. About a month ago, I decided to leave astronomy research to pursue only education. For the year leading up to this decision, I struggled against adding to the statistic that women leave science research more often than men. I wanted to become a professor to positively influence other aspiring astronomers and to reach the life’s goal which I thought would make me feel fulfilled. But when I faced the idea of spending many more years doing research, which has been making me miserable for some time, versus pursuing teaching, which I love almost unconditionally, I recognized a need to change direction. While I could easily spend this entire post looking forward to teaching, I also want to reflect back on what made it difficult for me to enjoy research. My story is unique in some ways, but I think it fits into the larger picture of why many people, especially women, tend to leave science research. One of my favorite books. Growing up, I wanted to be like her. I’ve always thought that women are just as capable as men, but I’ve never had faith that other people think the same. 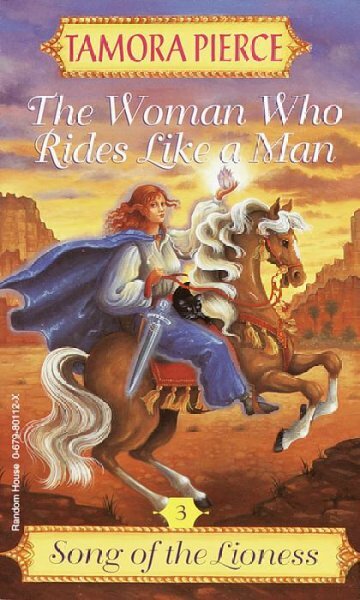 I was raised in a liberal town where I read fairy tales about strong, intelligent girls who defeated villains in the face of adversity and bias. As a result, as I grew older I decided to prove I belonged in my male-dominated math and science classes by being the “best” student possible. I didn’t feel I was the most brilliant person in the school, so I made up for it by studying like crazy. Not surprisingly, it worked. Concepts clicked. I aced exams and earned A’s. The underlying stress of trying to stay near the academic top never left, but that stress was regulated by a constant supply of grades. Even when I didn’t score perfectly, I knew I could make up for it on another exam or in another class. I learned how to learn and had fun doing it. When I started research as an undergraduate, I hoped it would be exciting. To be honest, it wasn’t: reducing data is not exciting to me. I didn’t understand the scientific motivation, and when I read papers I felt stupid and confused. I felt everything I was doing was wrong, and without grades, I lacked a way to moderate those feelings. I constantly felt I was hiding some crucial mistake from my advisor. I was supposed to write up our work, but froze, terrified of revealing my incompetence. I procrastinated for weeks, and only pulled myself together to finish the project at the last second. Largely because of that experience, I deferred from graduate school. I found a job tutoring astronomy, math, and physics at UC Santa Barbara (incidentally, the exact job held by two astrobites authors before me), and I loved it. The goal of teaching–helping other people–was far more motivating than helping myself to stay ahead in an endless academic competition. Teaching challenged me; I quickly found gaps in my knowledge and communication skills. But I realized that staying honest and adapting my style in response to student feedback and self-criticism were more important than having an encyclopedic answer to every question. That attitude made it possible for me to become a better teacher without feeling like a “bad” teacher during the process. By finding ways to keep the material exciting for my students, I remembered what drew me into astronomy in the first place. “None of these costumes are truly scary. 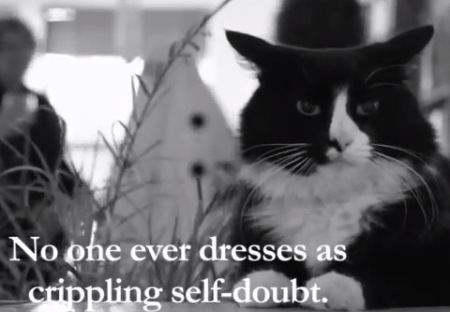 . . no one ever dresses as crippling self-doubt.” -Henri, on Halloween. I entered graduate school with revived determination. I knew I wanted to teach when I left, and I wanted to find out if I could enjoy research too. I blamed myself for the negative experience I had as an undergraduate. I resolved to find a project I cared about, to work harder than I had before, and to ask tons of questions, regardless of how stupid they made me feel. Although I attempted to change, my attitudes toward classes and research stayed the same. Actively asking questions did improve my understanding of astronomy, but when it came to my research, I was often wrong. Despite my best efforts to look at my mistakes objectively, I took the criticism personally. I felt I wasn’t smart enough, wasn’t progressing fast enough, and wasn’t good enough to ultimately compete in the astronomy community. The praise I received from my advisors didn’t stay with me because I barely believed it; awards I received didn’t feel worth it because the process that got me there was making me so unhappy. I might not paint a rosy picture of graduate school, but there have been good parts, too. By pushing myself to read papers and participate in scientific conversations, I stopped feeling intimidated by the literature and became genuinely interested in astronomy research. I learned cool things in my classes and I gained skills from my research. But more than anything, sharing an interest in astronomy with students has been the best part. I’ve been lucky to TA great classes and even co-teach. The more I teach, the more convinced I become that I want to dedicate all my time to education, and I’m grateful to have found that clarity. Looking back, I can think of plenty of advice to give a younger me. I would say that intelligence is not a gift: the brain is a muscle and grows stronger with practice. I would say that there’s no such thing as a perfect scientist; that the word “best” has no tangible meaning. I would point out that the inability to internalize success is common and even has a name: “imposter syndrome”. But being aware of those ideas doesn’t change my decision. I’ve been doing research because I thought I should, not because I was driven by the quest for knowledge or enjoyed the process. I know now that I am capable, but I don’t think science research will ever be fulfilling for me. I teach other people, but I do it largely for myself. 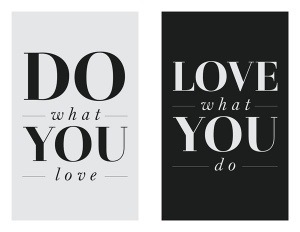 So if there’s one thing I would tell myself above all else, it’s this: find what you love, and go after it. My decision to leave scientific research might not count as a traditional success for women in science, but it is a success. I figured out how to be honest with myself and I chose to focus on education because I think it will make me happy. As an educator, I will have the opportunity to directly influence many more people–including women–than I would as an astronomical researcher, both by teaching in my own classroom and by working to improve the educational system when I can. I hope I can share the best parts of science with my students and with you all, our readers. I still admire scientific research without reservation and I encourage you to pursue it if you care about it. As for me, I suspect my own story would differ–for better or worse–if I wasn’t trying to prove myself in a biased world. While I can’t claim to have the solutions to inequality, I hope that sharing my experiences in the world today will make a small impact on it tomorrow. If we want to improve ourselves, either as individuals or as a community, acknowledging the challenges we face seems like a good place to start. Thank you for sharing your story! Do you think you could have enjoyed research more if the environment were more female-friendly or female-minded? And have you ever considered physics education research? Thanks! I honestly don’t know if I would have enjoyed research more if the environment were more female-friendly, but it is certainly possible. I am indeed looking into astronomy/physics education research and would love to do my thesis on it if I can, though it’s not clear yet if that will happen. Thank you for sharing your story! I consider it a success, congratulations on clarifying things with yourself. I also find it rather sad, that young, obviously talented and passionate women like you are lost to the higher levels of academia. Research and teaching do not have to be two binaries opposed to each other, they can be complementary as well. While I agree about your potential (and very important) impact in being a K-12 teacher, I find it sad that Science lost a potential passionate teacher and (much needed) female role model at the college level. Wishing you good luck and success in filling the pipeline with women in Science! Wishing you every success in Education – the world definately needs more passionate science teachers. Would you mind describing male bias you’ve encountered? I can’t see the connection between not enjoying astronomical research and astronomy not being “female-friendly”. Teaching is a great career and I’m sure you will be amazing, but it seems like an issue related to personal decisions rather than gender bias. The increased expectations and pressures I felt as a woman in a male-dominated field overshadowed my potential ability to enjoy astronomical research, not specific, explicit bias from people I have encountered. Implicit biases held by men, women, and even myself may have played a role, and those certainly could have influenced my future had I stayed in astronomical research, but that is much harder to pin down in a personal, non-statistical sense. I feel like you took the thoughts right out of my brain. I’m so glad to see I’m not alone, and inspired by your honesty with yourself (and us)! Thanks Alice for sharing your journey. I have personally been going back and forth on whether to pursue education or research. I am an undergraduate student at University of Colorado studying astrophysics. I really love teaching and think that great teachers are important at every level. Your article is inspiring and gives me confidence in whichever decision I choose. You’re very welcome! I’m happy to have helped. Best of luck with your decision-making! Those were my favorite books too! Also I enjoyed Dealing with Dragons by Patricia Wrede – another great woman lead going on adventures! Tall Alice Rose – it is a treat to see into your thought processes. While I am sorry research made you feel uncomfortable, I am delighted to read about you finding what you love, and working towards that. Also I hope you wind up somewhere Small Alice Rose (who just finished her freshman year at NHS) can find you to learn from you. Thanks, Lee! Also, wow, time flies! I guess small Alice is not very small anymore. Hope you both are doing well! My 11 year old daughter loves math and science. As she grows, I hope that she finds and learns from roles models such as yourself in school and higher education. The great thing about the future is you never know: the next Einstein or Newton could be just a helping-hand away. As a teacher, you have to learn a lot of cutting-edge Astronomy topics. You have to stay nearly research environments, because the only way that your students become interested in Astronomy is that they feel that they can push forward our knowledge of the universe in which we live. I think there is a problem with a lot of teachers and is that they teach as if the science was end an closed, they are investing more time in repeating what books says about theory that a science as a problem-solving skill. I feel you can not leave research in order to be a good teacher. Thanks for writing. When I was a graduate student, I dealt with the same issues. I am a male, but still suffer tremendously from Impostor Syndrome among other issues that tend to be associated with the struggles of females in science. I know that I am lucky not to have dealt with the additional pressure and skepticism that can come with being a woman or minority in science. I ended up completing my PhD, but knowing I did not want to do research full-time, got a faculty job at a teaching-first university. I still get to dabble in research, mainly through smaller undergrad student projects, but mostly I educate. I love it, and I have a much larger impact on the next generation. In fact, while I sometimes teach science majors, I primarily focus on preparing future elementary school teachers – mainly women – that will have a direct impact on how the youngest students feel about science and their place in it. I hope that if elementary school teachers make all their students feel comfortable with science, that many of them, boys and girls, will own it and pursue it when they get older. Education is hugely rewarding, and has many niches to fill, so hopefully you find yours! Thanks for sharing–your current job sounds great. 🙂 I am very happily working on an astronomy education thesis now, so things have developed nicely since I wrote this post!